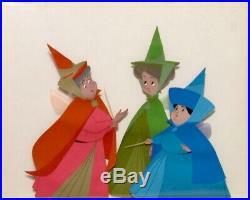 FLORA, FAUNA, & MERRYWEATHER PRODUCTION CELS WALT DISNEY STUDIOS GOUACHE ON CEL, 1959. Original hand painted and hand inked production animation cels of Flora, Fauna, and Merryweather set on a lithographic background from "Sleeping Beauty, " 1959, Walt Disney Studios; Unframed. Fauna: Oh, I just love happy endings. "Sleeping Beauty" is a Walt Disney animated full length feature film and was based on "The Sleeping Beauty" by Charles Perrault and "Little Briar Rose" by The Brothers Grimm. The film was the sixteenth in the Walt Disney Animated Classics series, and it was released to theaters on January 29, 1959 by Buena Vista Distribution. This was to be the last Disney adaptation of a fairy tale for many years, both because of its initial mixed critical reception, and because of it's under performance at the box office. The Walt Disney studio did not return to the fairy tale genre until 30 years later, with the release of "The Little Mermaid" in 1989. "Sleeping Beauty" was directed by Les Clark, Eric Larson, and Wolfgang Reitherman, under the supervision of Clyde Geronimi. The story was written by Joe Rinaldi, Winston Hibler, Bill Peet, Ted Sears, Ralph Wright, and Milt Banta. The film's musical score and songs, featuring the Graunke Symphony Orchestra, was under the direction of George Bruns. Arrangements and/or adaptations were derived from numbers from the 1890 "Sleeping Beauty Ballet" by Pyotr Ilyich Tchaikovsky. In addition, Igor Stravinsky's music compositions were also adapted into the film. "Sleeping Beauty" was the first animated film to be photographed in the Super Technirama 70 widescreen process, as well as the second full-length animated feature film to be filmed in anamorphic widescreen; following "Lady and the Tramp" four years earlier. In select first-run engagements, the film was presented in Super Technirama 70 and 6-channel stereophonic sound. Flora, Fauna and Merryweather are Princess Aurora's Fairy Godmothers, who appear at baby Aurora's christening to present their gifts to her, as well as go on to become her guardians. 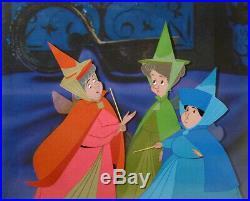 The Fairies were voiced by Verna Felton (Flora), Barbara Jo Allen (Fauna), and Barbara Luddy (Merryweather). Verna Felton also voiced Queen Leah, Aurora's mother; and had prior roles as Dumbo's mother in "Dumbo, " the Fairy Godmother in "Cinderella, " the Queen of Hearts in "Alice in Wonderland, " and Aunt Sarah in Lady in the Tramp.
" Barbara Luddy had previously voiced Lady in "Lady and the Tramp. " The principle animator for the Three Fairies was Ollie Johnston and a little known fact is that one of the actresses who was one of the live action models for the Good Fairies was Frances Bavier, the future Aunt Bee on "The Andy Griffith Show. Fauna is the middle Fairy and is dressed in a green gown, a green hat, and a green cape clipped with a green triangle. Her gift to Aurora is the gift of song. Flora is the tallest and oldest Fairy, dressed in a red gown (although she is obsessed with the color pink), a red hat, and a red cape clipped with a yellow square. She is the strongest-willed leader of the group, and her gift to Aurora is the gift of beauty. She also created for Prince Phillip the powerful Sword of Truth and the invulnerable Shield of Virtue, for his escape and battle with Maleficent. Merryweather is the shortest and youngest Fairy, dressed in a blue gown, a blue hat, and a blue cape clipped with a blue circle. She is the Fairy who is the most verbal and aggressive towards Maleficent, and she is much bolder than the other two Fairies. As Merryweather is about to give her gift, Maleficent makes her appearance and curses Aurora to die when she touches a spinning wheel's spindle before the sun sets on her sixteenth birthday. Merryweather's gift to Aurora is to weaken Maleficent's curse so that instead of death, Aurora will fall into a deep sleep until she is awakened by true love's kiss. This is a wonderful set of original hand painted and hand inked production animation cels of all three Good Fairies, Flora, Fauna, and Merryweather from the Walt Disney masterpiece "Sleeping Beauty, " 1959. All three Fairies are eyes open and large impressive images. This is an extremely beautiful piece of original vintage artwork, that would make a great addition to any animation collection! Measurements: Size - Flora, Fauna, & Merryweather: 8 1/4 x 10"; Image 9 1/4 x 11 1/2". Condition: See pictures of the actual cels, which are in excellent overall condition, as shown by the pictures above! All items we sell are from a smoke-free/mold-free home/workplace and are in excellent condition, unless otherwise noted. I own every work pictured for sale and I stand behind every item. Please follow/bookmark me as a favorite and keep and keep checking back for more items for sale in the coming weeks. For now, please check out my other Animation Drawings and Cels and other original modern and contemporary artwork for sale! The item "1959 RARE DISNEY SLEEPING BEAUTY 3 FAIRIES MERRYWEATHER ORIGINAL PRODUCTION CEL" is in sale since Sunday, March 24, 2019.